The RR bus stand the make shift bus stand near the Fort (Opp Fort lake) was demolished this morning by the Corporation officials saying it was illegal and they did not take any permission. 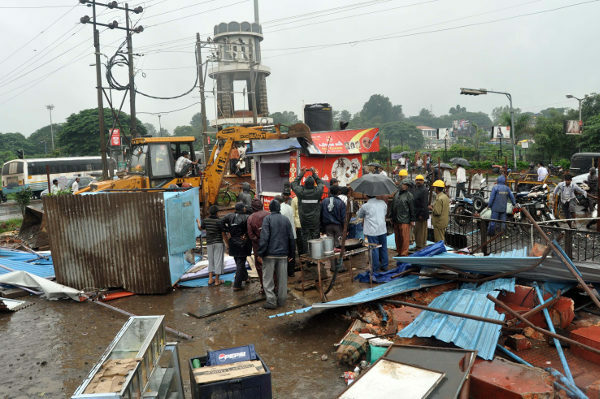 As the corporation employees and police gathered along with bulldozers near the site, a scuffle spiked off inbetween BCC employees and the Hamals and petty shop owners. The KSRTC employees had demanded that this illegal bus stand be removed and the same was discussed in various meetings recently. 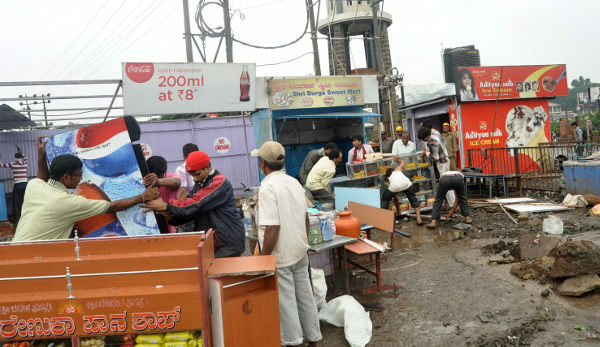 18 petty shops were removed from the area. The RR bus stand was being operated without any permission it is said. Who owns RR bus service?? RR bus stand is back as it was… up & running the same day evening. The infrastructure is up as it was, done at lightening speed as of nothing happened. BCC did its job of demolition, it was a perhaps a mere formality. Your website & leading newspapers covered the news. Height of corruption and Bribery! The RTO does not act on RR people even though they do not have licence to operate they way they are doing. In past they have been fined only. The bus stand is illegal & gas been operational for long. All concerned officials of government have been sleeping as they operate in connivance with this operator. It’s a mockery of our system that on same day after being demolished, things are back to normal at the site. All up & functional. Well if there was no permission that was wrong. It should take necessary permission and start the Bus service as the RR bus has really given good service to the general public with competitive price and travel time. I think this bus stand was much better than central and city bus stand inetrms of infrastructure!!!! If it was illegal, how come it was operating full fledgedly since past 3 years at the current location, and did not come in view of the BCC officials. Was it invisible??? It was right there in everyone’s view. And now out of nowhere it is illegal. Guess there are a lot of questions that are going to go unanswered. Ha Ha, it was BROUGHT into BCC notice, so if no one reports, BCC is not bothered, awesome.